A subscriber notified me last week that his actual returns were less than what I show on the website and blog. I researched this with his broker and one other, and I found that slippage had increased and, in some cases, commissions had increased. To better match actual client results, I am adjusting what I estimate for commission and slippage going forward. I am now using $50 roundturn for ES, $70 roundturn for EMD & TF, and $40 roundturn for NQ & YM (before 8/1/16, for intraday systems, $50 per roundtrip trade had been deducted to account for commission and slippage, and for swing systems, $20 roundtrip commission and 1 tick slippage each side had been deducted from each trade). Based on account performance provided to me, the new commission and slippage estimates probably slightly understate the actual slippage for the original version of the portfolios, however they probably overstate the actual slippage for the A & B versions. To keep things manageable, I’m using the same estimates for all versions. Starting now, the blog and “since release” results will be using these new values. I will update the website performance reports with the new values when I update results after this month ends. 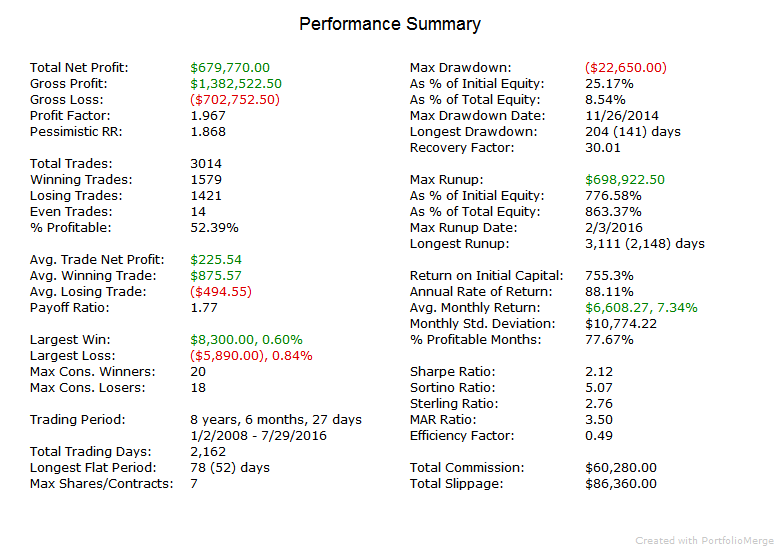 For a quick comparison of the effect, below is the performance summary for the Index Trader V Portfolio with the previous and updated estimate of commission and slippage. Past performance is not necessarily indicative of future returns.